Description: M-528/528L are the additives for hydraulic fluids used in subsea production control systems. They provide corrosion protection for steel, copper, brass, aluminum, bronze, galvanized steel, and other ferrous and non-ferrous metals and their alloys. M-528/528L prevent corrosion in both phases: contact and vapor. 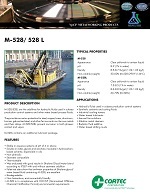 FEATURED IN : Cortec M-528/528L Featured in Pollution Equipment News!